﻿ PORTWELL ANNOUNCES INDUSTRIAL ATX MOTHERBOARD RUBY-D718VG2AR UTILIZING THE 6th GENERATION INTEL® CORE™ PROCESSORS- Portwell, Inc. 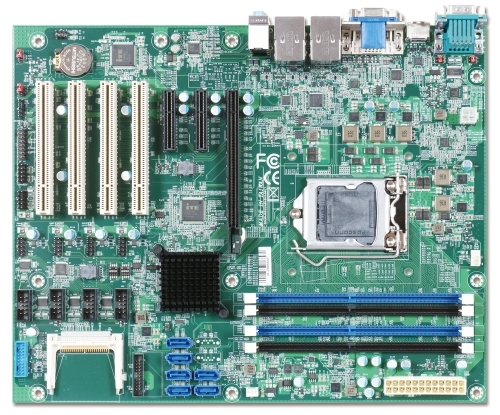 Portwell.Inc., (http://www.portwell.com.tw), a world-leading innovator in the Industrial PC (IPC) market and Premier member of the Intel® Internet of Things Solutions Alliance, announces today the Portwell RUBY-D718VG2AR which adopts the ATX form factor and utilizes the 6th generation Intel® Core™ processors. Portwell's new RUBY-D718VG2AR is designed to provide high performance and flexibility for functional expansions, and is ideal for applications in industrial automation and control, gaming, medical/healthcare and military. The 6th generation Intel® Core™ processors are manufactured on Intel's leading 14nm manufacturing process technology and deliver enhanced performance at the lowest power levels ever. The Intel® Q170 chipset continues to work on the edge of innovation with a new architecture to deliver quality, performance, and industry-leading I/O technologies on the platforms powered by the 6th generation Intel Core processor family. Portwell has taken the advantage of these advanced technologies to create a series of products that provide smart security, cost-saving manageability, and intelligent performance for industrial platforms. Portwell's RUBY-D718VG2AR features the Intel® Q170 chipset and the 6th generation Intel Core processors in an LGA1151 socket. The processors support two-channel DDR4 DIMMs and PCI Express 3.0 to provide fast memory and I/O performance. The RUBY-D718VG2AR offers advanced features, including SATA storage specification with up to 6 Gb/s, six SATA III interface connectors to support RAID 0/1/5 and 10 modes, the latest PCIe 3.0 (one PCI Express x16 slot) to enhance speed and bandwidth, as well as two PCIe 3.0 x4 slots and four PCI slots. In addition, RUBY-D718VG2AR is designed with the latest USB 3.0 high speed transmission technology, supporting 14 USB ports (six USB 3.0 ports and eight USB 2.0 ports); up to 64GB DDR4 2133MT/s SDRAM support via four long DIMM memory slots; triple independent display support including VGA, HDMI and DVI-D, available in both clone and extended modes;, and dual Gigabit Ethernet connectors. Portwell's RUBY-D718VG2AR is equipped other industry-oriented features such as six COM ports and one CFEX interface. Implemented with numerous COM ports, the RUBY-D718VG2AR is capable of providing multiple controls for legacy systems that are in use in power plants, for example. Built with a CFEX slot, the RUBY-D718VG2AR enables customers to choose flexible functions based on CFEX specific interface for their different industrial demands. In addition to the original storage functions, CFEX also provides advanced monitoring abilities, portable BIOS for security purpose and extensions based on CFEX interface definitions. Once again, Portwell demonstrates its expertise and experience in the IPC field through the developing of RUBY-D718VG2AR industrial ATX motherboard that fulfills all the industry related requirements. Portwell’s RUBY-D718VG2AR features the Intel® Q170 chipset and the 7th & 6th generation Intel® Core™ processors in an LGA1151 socket. The processors support two-channel DDR4 DIMMs and PCI Express 3.0 to provide fast memory and I/O performance. On the other hand, it equipped six COM ports is capable of providing multiple controls for legacy systems. RUBY-D718VG2AR is suitable for medical, industrial automation, and digital signage application.